Each week, we compare all 32 NFL teams using our Football Relativity comparison. On the comparison, the 10 level is reserved for the best teams, and the 1 level for the worst. Normally, we note throughout where teams have moved up or down from last week. But this week, we go from comparing all 32 teams to focusing on the 12 playoff teams. All of these teams were at the 7 level or higher last week. 10 – Green Bay Packers – The Packers closed out the season with a win even after sitting QB Aaron Rodgers and CB Charles Woodson, among others. At 15-1, Green Bay is not a perfect team, but they have a dynamic offense and a defense that causes turnovers. We’ve seen in recent years that this is a potent combination in the postseason. Green Bay may not be built to win a slugfest, but there aren’t many teams that could force the Packers into that kind of game. 9 – Baltimore Ravens, New Orleans Saints – The Saints closed with a flourish to finish 13-3, but it wasn’t enough for them to get a bye week. The Saints are nearly the Packers’ equal, and are built in much the same way. But the path New Orleans will have to take – a home game against a dangerous Detroit offense, followed by a road trip to San Francisco – may be too much. We see the Saints winning this week (something like 45-31), but we’re not sure they’ll even get to Green Bay for a rematch of Week 1. The Ravens, meanwhile, earned a bye by locking down the AFC North. That’s key, because it takes away the possibility of laying an egg in the first round. We rate the Ravens above the Patriots because we like their ceiling more, but Baltimore hasn’t always been the most consistent team. But we can certainly see them gearing up for two big games and making it to the Super Bowl. 8 – New England Patriots – The Patriots earned home-field advantage throughout the AFC playoffs, but their defense once again showed major holes against Miami in Week 17. New England won’t be able to survive against Baltimore or Pittsburgh if they fall behind early like they have in the last two weeks. But we’re not sure those problems can be solved during a single bye week. 7 – San Francisco 49ers – The 49ers are unlike any of the other top teams in the NFC and maybe even in the league in that they’re built around an elite defense. If they can turn their divisional-round game (likely against the Saints) into a slobberknocker, they might be able to get a playoff win. But Alex Smith, Frank Gore and company don’t have enough firepower to keep up with the Saints and Packers and Patriots. The 49ers simply aren’t good enough on red-zone offense to make a long playoff run. 6 – Pittsburgh Steelers – The Steelers are an odd team. They have the look of a contender, since they are coming off a Super Bowl appearance last season and have a championship pedigree. But it will be interesting to see if the Steelers really are at that level. While the offense has incredible punch with WRs Mike Wallace and Antonio Brown, we don’t think the Steelers can beat the Patriots or Ravens on the road. But they should have enough firepower to get through a trip to Denver this week. 5 – New York Giants, Detroit Lions – We put these teams above other wild-card weekend participants because of ceiling. The Lions have a high ceiling because of offensive firepower. The defense can’t stop the pass, which is a bad omen heading into a game against the Saints, but if the Lions somehow create a few turnovers, they could outscore the Saints. The Giants, meanwhile, looked like a team that’s finally getting healthy against the Cowboys. With playmakers like WR Victor Cruz on offense and DE Jason Pierre-Paul on defense, the Giants can put together a peak performance. We see them winning this week against Atlanta, and if so they’ll challenge the Packers because they always seem to rise to the occasion. 4 – Atlanta Falcons – The Falcons are a good team but not a great team. They can beat lesser teams, but they really haven’t risen to the occasion to beat a better team at any point this year. That’s enough for a playoff berth, but it’s not enough to advance now that the postseason has arrived. We see them being one-and-done again this year. 3 – Houston Texans – The Texans aren’t the team they could have been without major injury problems, but they still have enough upside to get a home win this weekend. Who knows who will play quarterback, but with a strong running game and an attacking defense should be enough for a feel-good moment in the franchise’s first playoff game. 2 – Cincinnati Bengals – The Bengals are a junior version of the Panthers, beating lesser teams but never rising to the occasion against a better opponent. They even lost to the T.J. Yates-led Texans a month ago. Credit to Cincinnati for making it to the good level in QB Andy Dalton’s rookie year, but the run ends this week. 1 – Denver Broncos– The bloom seems to be off the Tim Tebow rose after a three-game losing streak, but the real problem is that the defense has also declined. We believe Tebow has shown enough to earn an offseason of development as the starting quarterback, but that doesn’t mean we expect him to overcome the Steelers this week. At least Broncos fans get to enjoy the buildup to a home playoff game. Rise – San Diego Chargers – The Bolts dominated the Ravens at home on Sunday night, posting a 34-14 win. Whatever their midseason problems were, San Diego appears to have figured them out. It may still be a case of too little, too late, because San Diego remains a game behind the Broncos in the AFC West. But they are playing much better, and that has them on the rise. Sink – New York Giants – The Giants followed up a key win in Dallas in Week 14 with a stinker at home against Washington in Week 15. As a result, they once again fall a game behind the Cowboys in the NFC East. If the Giants were going to be a playoff game, Sunday’s game was one they had to win. Instead, they fell apart at the least opportune time. Float – Green Bay Packers – Yes, the Packers lost for the first time all season. But that doesn’t change our belief that they’re still the class of the league. Now Aaron Rodgers and company must show that they can decipher and overcome the strategies the Chiefs used against them so that they can avoid being limited to 14 points in future games. We have every belief that the Pack will be able to do that. For National Football Authority, we preview the matchup between the Green Bay Packers and the New York Giants. Can the Giants end the Packers’ unbeaten run and get back in the NFC East race? 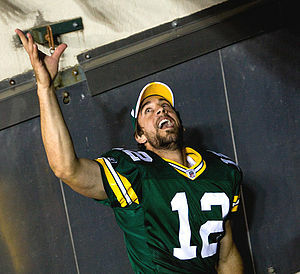 Or will the Packers protect Aaron Rodgers and get another win? Click here to find out. Rise – Denver Broncos – You may call it the power of Tim Tebow, but the reason the Broncos are rising into the AFC West race is a defense that is playing lights-out right now. Rookie OLB Von Miller is a force, but the entire defense excelled once again in the Thursday-night 17-13 win over the New York Jets. Tebow may be 4-1 as a starter, but that’s in large part due to the defense that allowed 15, 10, 24, and 13 points in those four wins. If the defense can keep games low-scoring, Tebow doesn’t have to be dynamic – he just has to make a play or two. That will be enough for Denver to make a run at 9-7, which could be enough to win a competitive but mediocre division. Sink – New York Giants – We floated the Giants last week after a road loss to the 49ers, but falling at home to the Michael Vick-less Philadelphia Eagles is inexcusable. Eli Manning has had some great games this season, but Sunday night wasn’t one of them, as he completed just 18-of-35 passes and threw an interception. Now the Giants face a full-on dogfight from the Dallas Cowboys in the NFC East, and chances are just one of those teams can make the postseason. Float – Detroit Lions – The Lions fell behind to the Carolina Panthers at home by 17 points, but rallied for a 49-35 win. While Detroit has a high-powered offense, the Panthers’ performance again raises questions about whether the defense is built for the long haul. Still, at 7-3 the Lions are in the playoff hunt, and a few more offensive explosions will get them there. The question this week is whether they can explode against the Packers on Thanksgiving and keep up with Aaron Rodgers and company on the scoreboard. 10 – Green Bay Packers – The Packers were tested in Minnesota – until CB Charles Woodson took advantage of rookie QB Christian Ponder not once but twice. Meanwhile, QB Aaron Rodgers was pitching a near perfect game. The Pack enters their bye 7-0, and they’ve served notice that the title defense is on in Titletown. 9 – New England Patriots, New Orleans Saints – The Patriots were on bye. The Saints broke out the whooping stick in a 62-7 home win over the Colts. It was a complete performance that highlighted what the Saints can be at their best. They’ll have a great chance at an encore next week in a visit to St. Louis. 8 – Atlanta Falcons (UP A LEVEL), Baltimore Ravens (DOWN A LEVEL), Houston Texans (UP A LEVEL), Pittsburgh Steelers, San Diego Chargers – We’re temped to dock the Chargers after a poor offensive performance in New York against the Jets, but we’ll leave them be for now since that road trip was a tough game. But the Bolts need to bounce back and play better soon, because the Chiefs are on the charge in the AFC West. The Steelers took care of business in Arizona with a 32-20 victory, setting up huge home games against New England and Baltimore in the next two weeks. The Falcons got a win in Detroit and seem to have found themselves the last few weeks. That’s a good feeling as the Dirty Birds head to their bye. The Texans won a big game in the AFC South and did so in convincing style, 41-7 over the Titans. They have a chance to knock off another division foe next week at home against the Jaguars. The Ravens played those Jaguars this week and lost on Monday night. It was a horrific offensive performance as, for the second time this season, Baltimore laid a major egg on the road. They must bounce back against Arizona this week before facing off against the Steelers the following week. 7 – Buffalo Bills, Dallas Cowboys (UP A LEVEL), Detroit Lions (DOWN A LEVEL), New York Giants, New York Jets, Oakland Raiders, San Francisco 49ers, Tampa Bay Buccaneers – We covered the Cowboys’ nice win and the Cowboys’ disappointing loss in Rise/Sink/Float. The 49ers, Giants, and Bills were on bye. The Buccaneers lost in London to the Bears, and they were wracked by injuries to RB Earnest Graham and others. The bye is coming at a key time for the Bucs. The Jets put together a comeback win against the Chargers to move to 4-0. Gang Green has been up and down, but after the bye they need to learn to win on the road. The Raiders were embarrassed against the Chiefs, but they hope the upcoming bye week will help new QB Carson Palmer get ready to contribute. 6 – Chicago Bears, Philadelphia Eagles – We covered the Bears’ win in London in Rise/Sink/Float, and the Eagles were on bye. 5 – Cincinnati Bengals – The Bengals were on bye. 4 – Cleveland Browns, Kansas City Chiefs (UP A LEVEL), Seattle Seahawks, Tennessee Titans (DOWN A LEVEL), Washington Redskins (DOWN A LEVEL) – The Chiefs went into Oakland and took advantage of bad quarterback play to shut out the Raiders. Suddenly, despite injuries, the Chiefs are 3-3, and if they can beat the Chargers next Monday night, they’ll control their own destiny in the AFC West. It’s an impressive turnaround after an awful start. The Browns beat the Seahawks 6-3 in a terrible aesthetic game. But the Browns are 3-3, which is a nice feat – even though the schedule has been favorable. The Seahawks competed on the road, but while the defense is pretty good, the offense ain’t. The Titans got blasted by the Texans in a key AFC South matchup, and there’s no question they’re now a step behind Houston in the division. The Redskins missed an opportunity in Carolina, falling to 3-3 and losing ground in the NFC East. 3 – Carolina Panthers, Denver Broncos, Jacksonville Jaguars (UP A LEVEL) – The Panthers finally got a win with a 33-20 decision over the Redskins. They have a chance to build on that momentum at home against the Vikings this week, which would put them at 3-5 entering the bye. That would be a nice step forward for QB Cam Newton and company. The Broncos also got a win thanks to last-minute heroics from QB Tim Tebow, who isn’t pretty but still finds a way to deliver in the clutch. Denver hosts Detroit this week. The Jaguars followed a competitive performance in Pittsburgh with a win against the Ravens at home. Jacksonville’s defense is coming on, and that’s a good sign. Now rookie QB Blaine Gabbert must start to make progress too. Amazingly, if the Jaguars can win in Houston this week, they will be 3-4 with wins over both of their main division rivals – basically in the thick of the race. 2 – Arizona Cardinals, Minnesota Vikings – The Vikings lost to the Panthers, but Christian Ponder’s starting debut showed promise. The Vikings have an easier draw in Carolina this week. The Cardinals stuck around but ultimately fell victim to the Steelers. A trip to Baltimore this week is no easy place to bounce back. 1 – Miami Dolphins, Indianapolis Colts, St. Louis Rams – The league’s winless crew embarrassed themselves again. The Dolphins blew a 15-0 lead in the final three minutes of regulation against the Broncos. The Colts were blasted 62-7 in New Orleans. The Rams fell to Dallas 34-7. We don’t see any wins on the horizon, either.